The Current Account add-on unique to Cashplus. One of the best things about a Cashplus Current Account is its potential to improve your credit score without paying any extra. With our Creditbuilder add-on, you could give your credit score the boost it deserves. Having a healthy credit rating is vital these days. It can help with everything from getting a mobile phone contract to having your mortgage application approved. In fact, Creditbuilder has already helped more than 200,000 people with all sort of credit issues - but don't take our word for it, take a look at some of their feedback below! "A great service to help repair a less than perfect credit rating, would recommend 100%"
"Very helpful for building up your credit rating"
Is Creditbuilder right for me? If you’ve recently moved to the UK, don’t have much credit history or your credit score could use some help, Creditbuilder is a handy tool to get you moving in the right direction. You’ll be entering into a 12 month contract, so you should only sign up if you're sure you can commit to making all 12 payments on time. Creditbuilder is a 12-month loan that you repay over 12 monthly payments. We lend you the equivalent of 12 months in account fees (£71.40 with an Activeplus or £119.40 with a Deluxe). We hold these funds for you, so you won't see them in your account and won't be able to spend them. You pay your monthly account fee as normal and we take it as a payment against your Creditbuilder loan, which we report to the Credit Reference Agencies. Once you've made all 12 payments on time, you'll have successfully paid off your Creditbuilder loan, which could help improve your credit score. Already have a Cashplus Account? Simply add Creditbuilder to your account via Online Servicing, with no joining fees. Too easy. New to Cashplus? You’ll need to open a Cashplus Current Account and request Creditbuilder as an ‘add-on’ during the application. 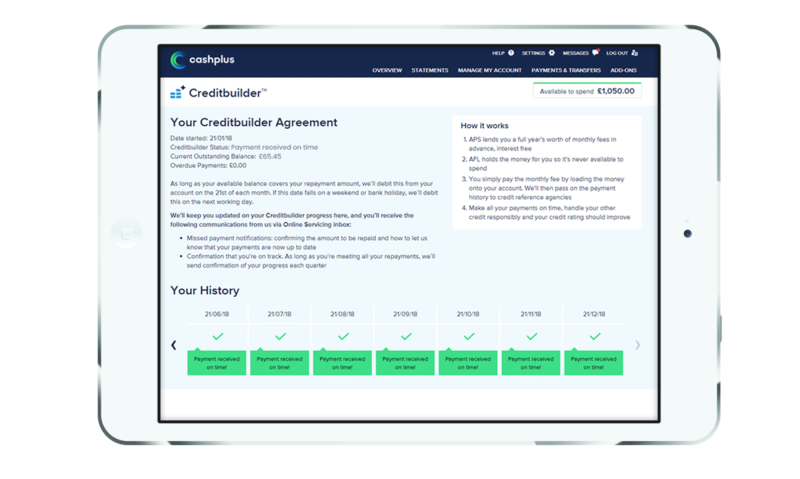 Track your progress through the Creditbuilder dashboard in Online Servicing or through the Cashplus App. There's lots of useful information here, including your payment dates, outstanding balance and payment history.